Panasonic has juts unveiled another four point and shoot Lumix cameras it has added to its range. Following on from the eight it unveiled at CES a few weeks ago. 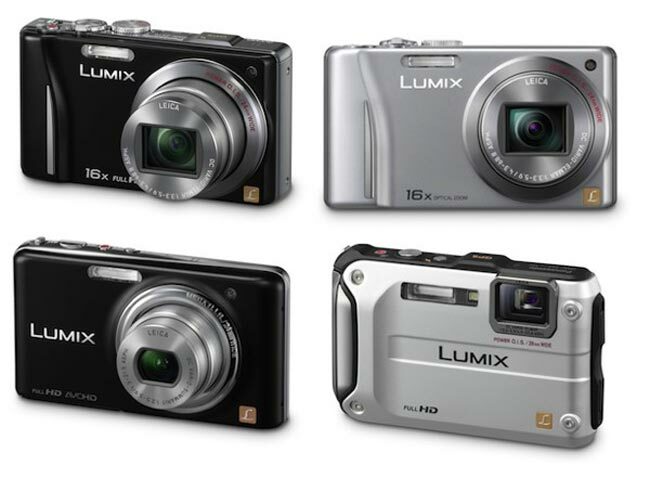 The new cameras are the Lumix ZS10, ZS8, FX78, and TS3. The Panasonic LUMIX ZS10 and DMC-ZS8 are equipped with a 16x optical zoom, a wide 24mm Leica lens and the ZS10 is capable of recording full 1080 videos, and the ZS8 720. It also features the new Panasonic 3D Photo mode, which produces a realistic 3D photo by taking 20 consecutive photos and overlaying the two best images which provide a 3D image that can then be played on a Panasonic VIERA 3D HDTV. Next up is the LUMIX FX78 that features a F2.5 Super-Bright 24mm Ultra-Wide-Angle Leica Lens and a large 3.5-inch Smart Touch LCD that allows for the Auto Focus (AF) to be set by simply touching the subject on the LCD. You can also release the shutter with just a touch of the screen if desired includes the 3D Photo mode. Finally the new LUMIX TS3 which is a 12.1 megapixel camera with a 28mm wide-angle Leica lens. Its waterproof, dustproof, shockproof and freezeproof and allows you to record in full 1080 HD. It also has a New 3D Photo Mode and makes it easy to upload your media to Facebook and YouTube. The new range will start shipping in March but Panasonic have not released any prices as yet.